While you struggle with your nutrition and confidence, you may understand the impact your missing tooth has on your oral health. Without a root to support, your bone begins to deteriorate, which takes away support for your remaining teeth. Your healthy teeth will begin to shift without a replacement for your tooth. This causes bite misalignment and an increased risk of damage or fractures to your teeth. It’s unfortunate that tooth loss left untreated will eventually lead to more tooth loss. 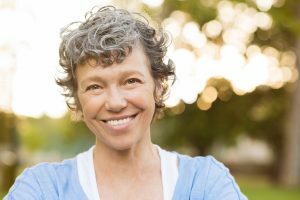 How Can Dental Implants Restore My Teeth? Dental implants replace your root with a titanium post, and your tooth with a natural looking porcelain crown. They are the only tooth replacement option to restore both your root and your tooth, which protects the integrity of your oral health. Because titanium is biocompatible, it will naturally integrate with your bone and create a firm foundation for your tooth, while also keeping your bone healthy. Your new tooth is customized to match and complement your smile, and restore all the function you had lost. This means that you’ll be chewing, smiling, and talking normally again. You’ll also be able to brush and floss like normal, which makes your implant easy to care for. Dental implants can be used to support dental prosthetics such as a bridge or denture, which means it’s possible to restore multiple missing teeth with this reliable treatment. A few implants strategically placed in the bone allows a denture to snap into place and creates a more secure fit than ever before so you don’t experience movement or slippage when you talk or eat. During a thorough examination, our doctors can determine if implants will work for your needs. Implants require enough healthy bone to support them, and if that’s not available, our doctors may recommend a bone graft procedure to build and restore your bone structure. At Pazmino Dentistry, we’re happy to offer comprehensive implant treatment, which means that instead of referring you elsewhere for aspects of your care, we’re able to handle all of your implant procedures here with the team you trust. Give your dentist in Temple a call today to learn more about how we can restore your smile!